Seth Evans takes the trophy while Charles Aron takes home the most money. The RunGood Poker Series at Harrah's North Kansas City this week was a record-breaking success. The weekend was capped off with U.S. Army veteran Seth Evans taking home the Main Event trophy. The Missouri native overcame a record field for the property of 423 entrants to win first-place in a heads-up deal with Charles Aron. 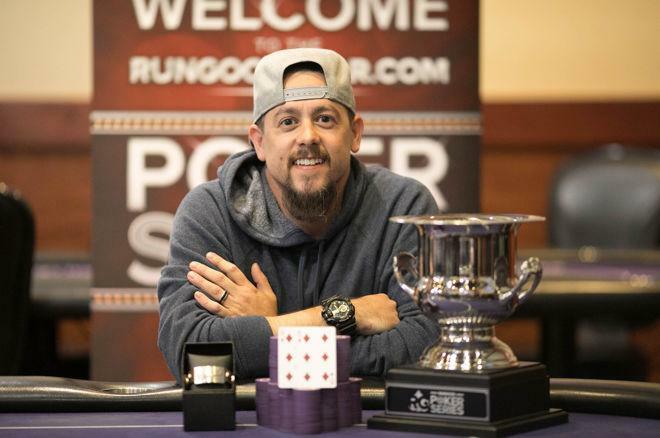 A regular at RunGood series, Evans finished second in the main event at the RGPS stop at the Tulsa Hard Rock in February for $32,099 and thirteenth in the RunGood main event at Horseshoe Council Bluffs for $2,066. He has bested both of those performances to take home $35,000 and the trophy in his home state. The road to becoming an RGPS Champion wasn't an easy one. He fired bullets in all three Day 1 flights of the main event before punching his ticket to Day 2 in the final flight. Evans came into Day 2 with just 79,000 chips at a time when the average was 97,241, and then chip leader Jesse Jones held 394,000. Evans tended his below-average stack all the way to the final two tables. He arrived at the final table in the middle of the pack, then took over the chip lead with some well-timed run good. With the blinds at 30,000/60,000 with a 5,000 ante, Evans called off his stack of 1,450,000 chips with against HPT Champion Matt Donaldson's on a flop of . Donaldson's set was all but a lock when Evans caught running , for a straight. The pot propelled Evans into the chip lead for the first time in the tournament, but don't assume it was smooth sailing from then on. Four-handed play alone lasted three hours, during which each player gained and lost the chip lead. Despite the prolonged battle during four-handed play, Evans quipped, "Final tables are fun. I should do this every time." Main Event runner-up Charles Aron eliminated the fourth and third place finishers to get heads up against Evans. Aron held a 2-to-1 chip lead at that point, but as the final table began its sixth hour of play, a deal was struck to give Evans $35,000 and the title of champion with $40,284 going to Aron. This tournament marks the conclusion of the RGPS USA in Kansas City. Thanks to the support from players at every stop this spring, RunGood reached its goal to secure 500 care packages for U.S. troops overseas as part of their season-long partnership with Operation Gratitude. An anonymous donor is matching the effort with an additional 500 care packages as a result of achieving this milestone. RunGood encourages everyone to continue to support this worthy charity now and in the future. Next up for RunGood will be the CardPlayer cruise beginning May 13. The cruise will feature an RGPS $675 Main Event with multiple satellites. The RunGood Poker Series goes on hiatus for the summer so their ambassadors can participate in the World Series of Poker in Las Vegas. RunGood will have a clothing booth inside the Rio for the duration of the series. A fall schedule of RGPS stops will be announced following the WSOP summer series.